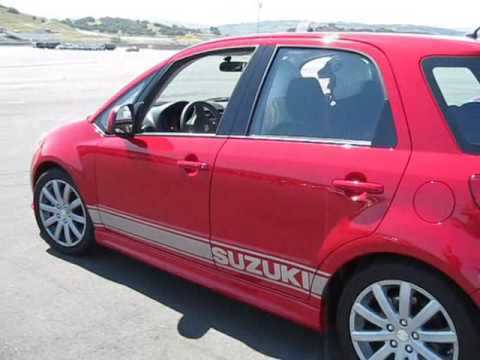 In 2008, Suzuki came out ready to brawl in the sport compact class with a four-door, sport-oriented sedan, the SX4 Sport. This pugsly fighter came rumbling onto the street scene with front-wheel drive instead of power robbing AWD, a sport-tuned suspension that rides lower than its more sedate siblings, 17 inch wheels, and an aero kit to give it a lower ride height. 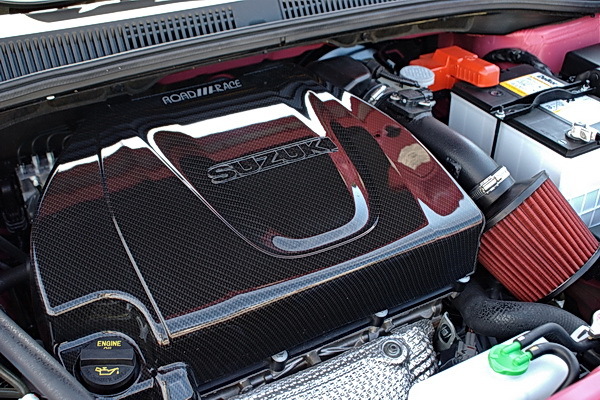 Suzuki even fitted a rear crossbrace in the sedan’s trunk for a 15 percent increase in structural rigidity over their corresponding hatchback model. The little sedan, with sporty aspirations, was outfitted with a 2.0L powerplant capable of producing 143 hp and 136 lb-ft of torque — all in an affordable package. 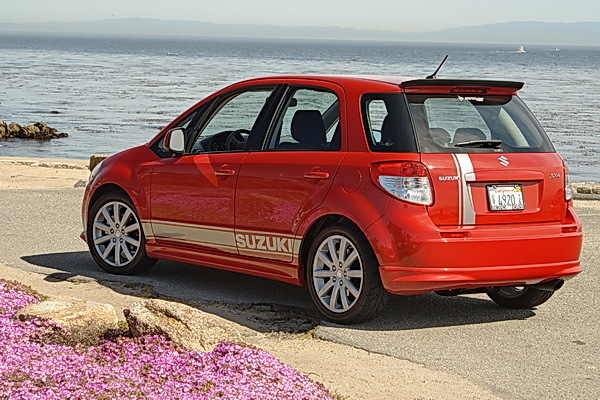 With the 2010 SX4 SportBack model, Suzuki wanted to spice up the hatchback version of the SX4 Crossover using a similar formula as the SX4 Sport sedan. The parasitic all-wheel drive system was replaced by more efficient front-wheel drive, a slightly larger and more powerful engine became standard, and an aero kit complemented with 17 inch wheels and tires developed by Dunlop specifically for the SX4 Sport completed the makeover. A peek inside this fancy crossover five-door reveals an all-new instrument cluster, aluminum-look trim accents (including the pedals), and integrated nav-system. 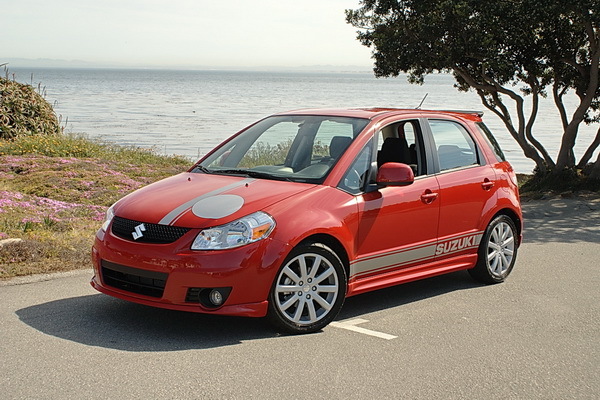 To make an impact with the import-tuner crowd and showoff the potential of the SX4 SportBack, Suzuki North America worked with Road Race Motorsports to produce a superfly version with parts from the RRM catalog. The new 2010 SX4 Sport was built to entertain and that is does with RRM tuned intake, exhaust, lowering springs, sway bars and RRM sport stripe kit along with other mods. Pop open the hood and underneath is an all-new 2.0 liter DOHC engine throwing out a hefty punch with 150 hp and 140 lb-ft of torque behind it — a 5% increase over last year’s model. Sensitive to the environment? Eco-conscious racers happily maintain their cred with the green earth crowd because EPA estimates are 30 mpg highway and the new engine has a smaller carbon footprint than older models. Gearheads can appreciate the cold-air intake (CAI) and carbon fiber engine cover that adorn this mighty 4-banger. With a few blips of the throttle, the notes that emanate from the RRM cat-back exhaust will make any street-racer within earshot instantly reach for the NOx valve as a defensive response. Play the video below to hear a sample of the SX4′s sweet exhaust note. On the road, the SX4 rides like a mad dog with a tenacious grip of the road. Power relayed from the close ratio 6-speed manual isn’t going to throw you back into your seat, but the tire and suspension setup will induce a white-knuckle ride once you find some turns. Not quite as balanced as a Mazda MX-5, but you can carry a scary amount of speed through the turns and exit with your heart racing faster than Speedy Gonzalez on a Red Bull-high. Speed is kept in check with 4-wheel discs, mated with race-spec brake pads, on all corners. If passenger comfort is a question, the Suzuki answers with power windows and locks, dual power rearview mirrors, tilt steering wheel, split folding rear seats and rear passenger floor vents. The SX4 SportBack’s interior trim gets an all-new instrument cluster, four-speaker audio system with MP3 and XM Satellite Radio compatibility, a driver’s information center, and armrest for the driver’s seat. Integrated navigation is standard. In addition, the folding rear seats and concealed storage bin behind those seats combine to provide a completely flat load surface. Suzuki, which is also battling against negative brand perception among consumers, says it is gradually winning points with skeptical U.S. buyers. It is offering new products backed by a seven-year/100,000-mile powertrain limited warranty that is fully transferable and is intended to improve Suzuki’s value position in the used-car market. If Suzuki turns out more products like the SX-4 SportBack in high-performance trim, then they are well on their way towards winning over many more fans.